When it comes time to pick the perfect white cotton sheets, you’re likely to find yourself confronted with an abundance of options. And since your sheets dress the most important piece of furniture in your bedroom, it’s best to carefully weigh all of these options so you can pick the bedding that best suits your body, your bed, and your lifestyle. So, allow Sleepopolis to do some of that research for you! In this review, we’ll be taking a close look at two sets of cotton sheets from Snowe Home. I’m going to thoroughly test both Snowe’s percale and sateen bedding sets so that you can get a better sense of how they feel, what sets them apart, and which sleepers might be most compatible with which material. No time to read the full article? Click here to skip to the review summary! Choose between Snowe's crisp percale or silky sateen (or both!) Save 10% on orders of $100 or more with the code SLEEPOPOLIS10! WHAT ARE SNOWE SHEETS MADE OF? Both Snowe’s percale woven and sateen woven sheets are made from 100% long-staple Egyptian cotton, which has a reputation for being strong, durable, and super soft. However, the feel of each sheet set is different because of the different weave styles used. They are also made in different countries, with the percale set made in Italy, and the sateen set made in Portugal. Snowe’s percale woven set features a 500 thread count, and is designed to offer a feel that’s more crisp, cool, light and breathable. These sheets feel super soft to the touch and are actually a little more smooth than some other percale sheets I’ve tested. They are built to be light and airy which might make them best suited to the warmer months when sleepers are trying to stave off night sweats. However, if you’re a sleeper who always runs hot, you’re likely to be compatible with these sheets year-round. The sateen woven sheets, on the other hand, feature a 400 thread count, and are a bit heavier in weight. They’re still oh-so-soft to the touch, but in a silky-smooth way that is more characteristic of this style of weave. Typically, sateen woven sheets are silkier, shinier, and lie heavier on the body as compared to percale woven sheets. If you want to learn more about how sateen and percale weaves compare, we spell it all out here in our informational guide! However, these sateen sheets were made to have less of that lustrous sheen that is so common with this weave style. 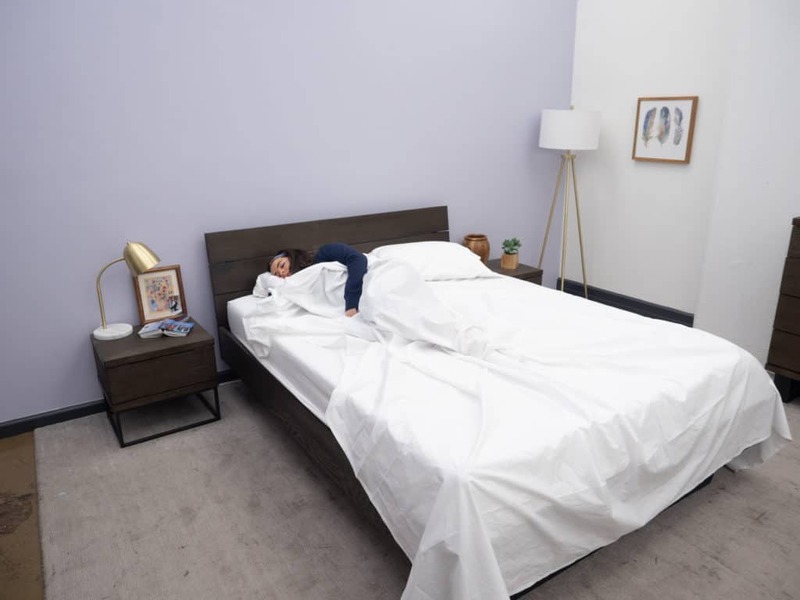 The folks at Snowe say that it’s a matter of personal preference, and they cater to sleepers who prefer their bedding to have more of a matte finish, no matter the weave. So, it’s important to note that both of these sheet sets have a matte appearance, not just the percale. The sateen sheets are slightly more lustrous, but the main differences between these two sheet sets lie within the feel (which we’ll get into next!). Both sheet sets come complete with a fitted sheet, a top sheet, and two pillowcases. 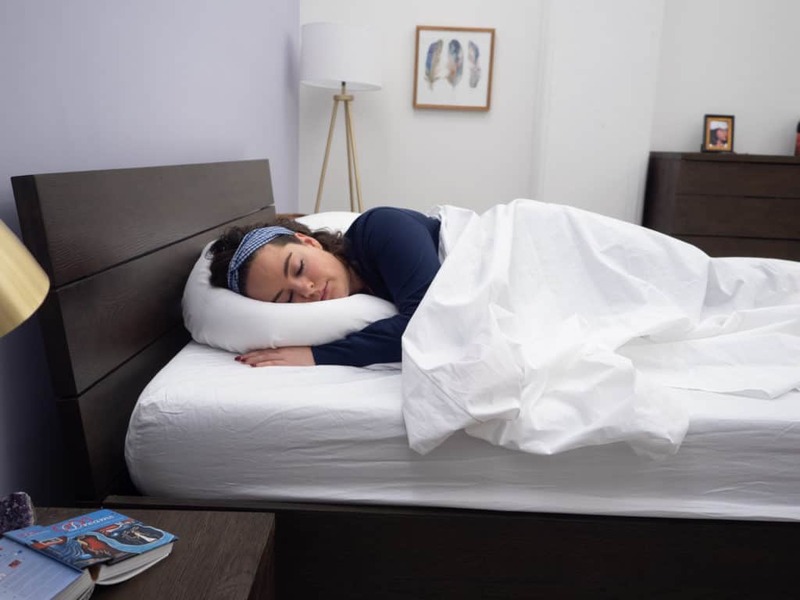 The fitted sheets have pretty deep pockets capable of accomodating mattresses up to 17 inches deep, so sleepers with deep mattresses might be particularly compatible with Snowe sheets. I’m testing both sheet sets in white here, but there are some other styles from which to choose including ivory, grey, blue, and a few others. However, it’s worth mentioning that Snowe caters to a more subtle aesthetic, and each sheet color offered is solid (no accent colors), and relatively muted for a more neutral design scheme. My first impression of these sheets is that they are both super soft, one in a crisply smooth way, the other in a silky way. From a visual standpoint, I’m having a little trouble distinguishing between the two sheet sets, so let’s take a dive into how these sheets feel so we can get a better sense for which one might be best for you. HOW DO SNOWE SHEETS FEEL? Snowe’s percale woven sheets are designed to feel crisp, light and and breathable. And while those traits are typically characteristic of a percale weave, Snowe’s percale sheets have an exceptionally smooth handfeel. Additionally, these sheets feel a bit thicker than some of the other percale sheets I’ve tested. So, they end up having this very soft, durable feel that makes me think they would be great for year-round use. However, these sheets are lighter in weight than their sateen counterparts, and they do have better breathability as well. So, between the two sets, Snowe’s percale set is going to sleep cooler. However, because they are more airy, they lie lighter on the body; so you’re not going to get as much of that elegant, body conforming drape that comes with the sateen sheets. Percale tends to be more crisp than sateen, and while these sheet sets are no exception, Snowe’s percale feels less crisp and more smooth than other percale bedding I’ve tested. They still have that freshly ironed dress-shirt look, but they don’t have that crinkly-crisp, classic percale handfeel, in my opinion. That being said, they aren’t as noisy as some other percale bedding I’ve tested. 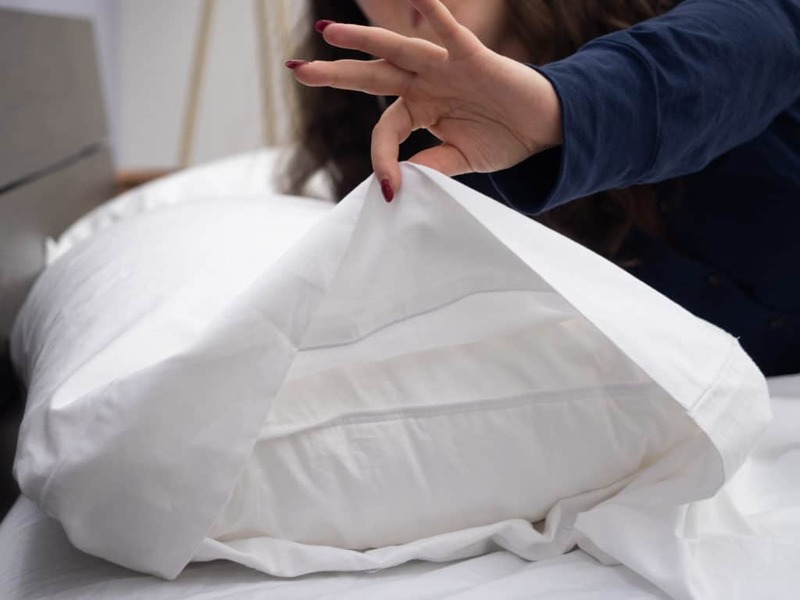 Often times with percale sheets, the crispness will contribute to a bit of a crinkling noise when you rub against the fabric. However, I found these particular percale sheets to be less starkly crisp and less noisy as compared to other percale bedding I’ve seen. As far as the look of these sheets is concerned, these are as close to pure white as you can get. Sometimes, due to garment washing or other manufacturing processes, white bedding can take on a bluish or ivory hue. Such is not the case with these sheets — they are white as freshly fallen snow (pardon the pun!). When you look at sateen sheets alongside percale sheets, you can often spot the difference between the two without even having to feel them. For me, that is not the case with these sheets. As I said, Snowe designs both their percale and sateen woven sheet sets to have a matte appearance, meaning neither is shiny. However, there is a noticeable difference in feel. Compared to the crisp cool handfeel of the percale sheets, the sateen set feels a bit heavier in weight and a little less breathable. So, as usual, it’s likely that the percale set is better suited to warm weather, though I do think that either set could be great for year-round use. These sateen sheets do lie heavier on the body, though, which allows the fabric to drape over your body’s shape in a more pronounced way (and keep you warmer too). While Snowe’s percale sheets are uncommonly smooth, the sateen sheet is smoother. Both are equally soft, in my opinion, but the sateen set is more buttery-smooth and silky, while the percale is more slightly more crisp. Both sheet sets are made from cotton, but the sateen sheets feel a bit more like satin while the percale feels closer to a freshly ironed shirt. While I found neither sheet set to be particularly noisy, the sateen set makes a bit more of a swooshing noise when you rub against the fabric. However, I got the sense that that sound would diminish completely after just a few washes. These sheets are also pure white with the slightest bit of luster to accent the folds. While I am generally partial to sateen bedding because I prefer a lustrous sheen and silky feel, I found both Snowe’s percale and sateen sheets to have more in common than I was expecting. Since I had pillowcases, fitted sheets, and top sheets from each sheet set, I decided to get a little creative and do some mix-and-matching. So, I dressed the mattress with the sateen fitted sheet, the percale top sheet, and the two pillows with one of each pillowcase. This way, I was bundled in a variety of Snowe feels, and could compare the two as I rolled around. Crawling into bed felt super smooth as the sateen fitted sheet offered a silky, slightly slippery feel that I quite enjoyed. Right away, I could feel how soft the fabric of both sheets felt against my skin, but I was a little surprised by how they looked. Nearly all the sateen woven bedding I’ve tested has featured that signature sateen sheen, but frankly, I was having a hard time telling the difference between Snowe’s sateen and percale sheets. 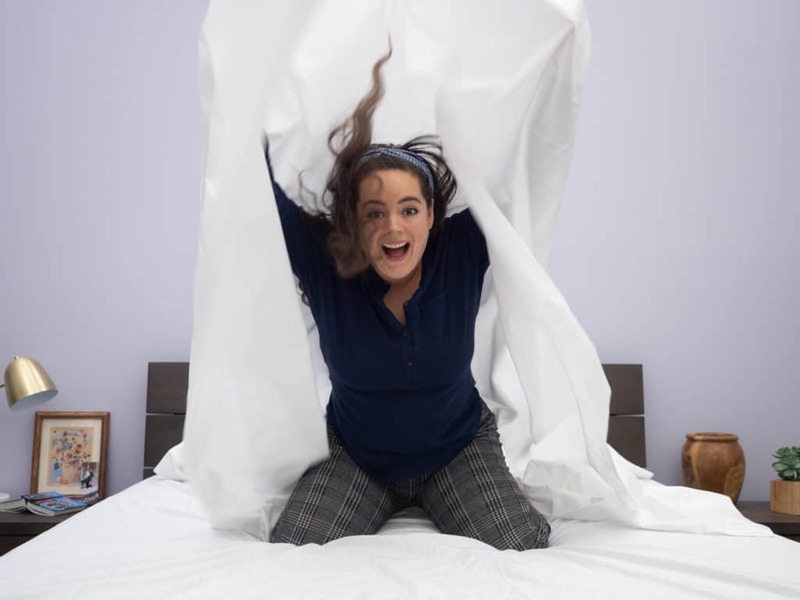 Before unboxing Snowe’s sheets, I already knew that the sateen set was designed to offer, as the company puts it, “all the buttery-softness of sateen without the lustrous sheen.” But I guess I wasn’t expecting the two sheet sets to look so similar. For folks who prefer the feel of sateen, but do not love the lustrous look, Snowe’s sateen sheets might just be perfect for you. Personally, I can’t get enough of that shiny, silky look, so I did find myself missing that a bit with these particular sheets. Meanwhile, I noticed that the percale top sheet was surprisingly smooth, and almost a little silky! So, while the percale top sheet did offer a bit more cooling crispness than the sateen sheet, I wasn’t feeling the same light breathability that I’m used to with percale. As I rolled around in bed, I couldn’t help but notice that each sheet set seemed to adopt a few characteristics that are often common with the other weave. What I mean by that is, the sateen fitted sheet had the matte look of percale, the percale top sheet had the buttery-smoothness of sateen, and both felt thick enough for year-round use. Despite the similarities, though, the sateen sheets proved to be more resistant to wrinkles (as usual!). Ultimately, I found the differences between these two sheet sets to be quite subtle. From an aesthetic standpoint, you really have to look closely to notice the slight sheen of the sateen sheets. In fact, as I was rolling around in this bedding, I occasionally had to rub my hands over the fabric in order to know which pillowcase was which. And even the feel was similar enough for me to second guess which fabric I was sleeping on at the time. That being said, I found the percale sheets to be a bit more light and breathable, while the sateen sheets did lie heavier on my body. Both offered an elegant drape over my body’s shape (which I love), though the drape was more pronounced with the sateen sheets. I do think that warm sleepers could enjoy the percale sheet set year-round, and the sateen sheet set might be a bit better suited to the cooler climate. Overall, though, I really enjoyed rolling around in this bedding. I mean, what’s not to like about smooth, soft, durable cotton sheets? However, I do personally prefer a little more distinction between my percale and sateen bedding. Verdict: When it comes to Snowe’s percale sheets, I’m extending the most enthusiastic recommendation to warm sleepers who prefer a little less crispness and a little more smoothness. For Snowe’s sateen sheets, I think folks who love the feel of sateen but not the lustrous look would be most compatible with these. While Snowe’s sateen and percale woven sheets do have similar personalities, they each bring their own special something to the bedroom. So, let’s compare each set side by side so you can get a good look at which one might be best for you. Likes a Little Crispness— Snowe’s percale sheets have a slightly crisper handfeel as compared to the sateen set, though they are still very soft and smooth. Imagine a dress shirt that’s been freshly ironed, but is still soft from years of washing. Sleeps Warm — Snowe’s percale sheets are more light, airy, and breathable, making them better suited for warm sleepers. If you sleep with your bedroom window cracked year-round, these might be the right pick for you! Prefers No Sheen at All — While both Snowe’s sheet sets are meant to offer a matte finish, the percale sheet set has absolutely no sheen, while the sateen set has a very subtle sheen. So, if you’re more into the solid, muted, matte look with no luminosity at all, I’d go for the percale. Prefers Subtle Sheen — If you love the silky-smooth feel of sateen, but wish it came without the intense, lustrous sheen that is common with this weave style, I heartily recommend you try these sheets. Sleeps Cool — These sheets lie heavier on the body as compared to Snowe’s percale sheets, and sleep a bit warmer. They aren’t warming (like flannel, for example) but they are less cool and breathable than the percale set. Prefers a Silky Feel — While these sheets don’t really look silky, they do have that creamy-soft handfeel that is common with this style of weave. Compared to the percale set, these feel less crisp and more silky. SHOULD I TRY SNOWE SHEETS? Soft & Durable — After rolling around in these sheets, I could tell that the Egyptian cotton used in both sheet sets offers a strong durability and super-softness that makes me think this bedding is built to last. As we know, not all cotton is created equal, so I was comforted to know that these are made from, long-staple, high quality cotton that feels as strong as it does soft. Easy Wash Care — Both sheet sets are machine washable and dryable which makes them pretty easy to care for; and the instructions are pretty much the same for each set, so you won’t get confused. Just wash on a warm, gentle cycle, tumble dry on low, and you’re good to go! Trial Period — Something that always relieves some of the pressure of sheet shopping is a trial period. Snowe offers sleepers a very generous trial period of 90 days during which you may test either of these sheet sets. If you decide you don’t like them, you can easily have them replaced or refunded. No Sateen Sheen — The sateen sheet set does not have that lustrous sheen that is common with this style of weave. For some sleepers, that sheen is the basis of sateen bedding appeal! So, if you know you like your sateen sheets to have that shiny look, you might want to test these first. Wrinkly Percale — As far as the percale sheets are concerned, they did seem to wrinkle easily. That’s pretty common with percale sheets, but from an aesthetic standpoint, it’s not ideal. Luckily, they are machine dryable, so I recommend pulling the sheets out of the dryer as soon as the cycle is finished so that you can spread them out over the mattress when they’re still warm and wrinkle-free. Subtle Aesthetic — Both sets have sort of a minimalist aesthetic. There’s no combination of colors or special design, and each set is only offered in five solid colors (including this one). So, if you’re looking for a sheet set with a bit more pizazz, it’s worth noting that these Snowe sheets appeal to a more subtle aesthetic. Built from 100% Egyptian cotton, the Snowe sheets have a great feel about them. In addition, they are stitched to near perfection and possess a very strong build quality. Their lightweight structure makes for a very cool and comfortable sleeping experience. 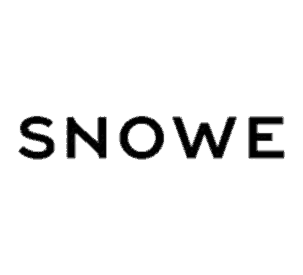 For the sleeper that’s looking for subtle color schemes and a dependable sheets, Snowe is a great option.